I acquired a fine print this past week. An historical figure from England. A man who had power and influence in government. The print is done by a man well respected in the art. They lived some 250 years apart. An absolutely lovely stipple engraving by the great #FrancescoBartolozzi of #ThomasMoreLordChancellor of England. Bartolozzi has based his engraving on a drawing by Hans Holbein and it was published on October 1, 1793 by I. Chamberlaine. Stunning technique join with subtle colouring bring to life this image of Thomas More. And no small image at that. It is roughly 16″ by 12″. Bartolozzi was born in Italy but spent a great part of his productive life in London. He lived in London for 40 years. This print of More is one of a series done by Bartolozzi after portraits done by Holbein of influential men and women in British society. 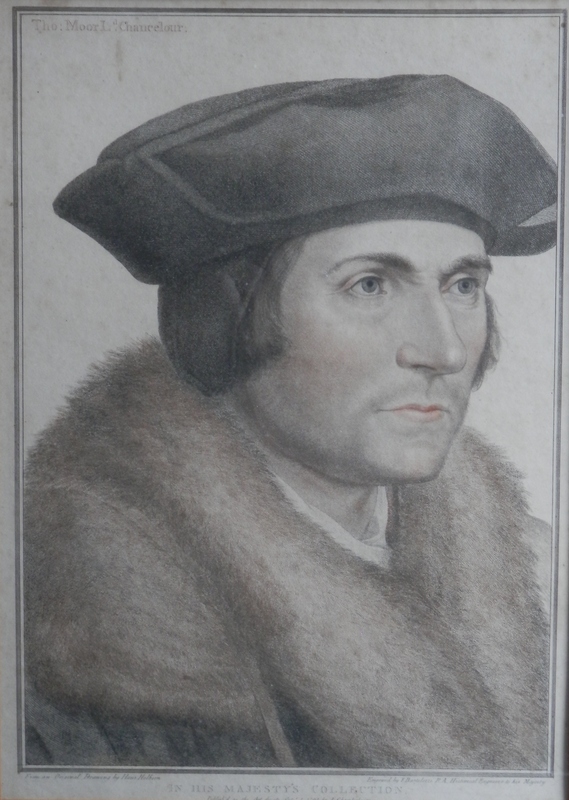 Sir Thomas More was a lawyer and councillor to Henry VIII. He was Lord High Chancellor of England for three years . He opposed the Protestant Reformation especially Tyndale’s and Luther’s theology. More opposed Henry’s separation from the Catholic Church by refusing to acknowledge him as head of the Church of England and by denying his requested annulment from Catherine of Aragon. For his stance More was tried and convicted of treason and was beheaded. This entry was posted in Etching and tagged government, Lord Chancellor, Thomas More. Bookmark the permalink.